Old Trafford was famously given the nickname The Theatre of Dreams by Bobby Charlton and is of course the football home of Manchester United, however it may surprise some Man Utd fans that although they originally played there from 1910 the team actually played at Man Citys Maine Road ground for 8 years between 1941 –1948 due to damage caused by German bombers to Old Trafford !! Prior to this Old Trafford set two very different attendance records, firstly in 1920 a then record crowd of 70,504 for Man Utd v Villa and then a year later Stockport County used the ground for a 2nd Divison game against Leicester that because of a Stockport fans boycott only attracted 13 spectators !! 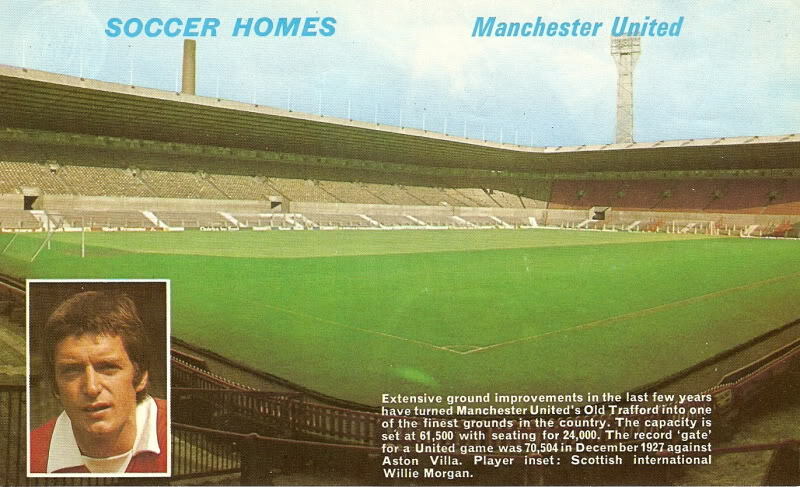 The picture below from a Football Review magazine shows how the ground looked in the 70’s. "Extensive ground improvements in the last few years have turned Manchester Uniteds Old Trafford into one of the finest grounds in the country. The capacity is set at 61,500 with seating for 24,000. The record 'gate' for a United game was 70,504 in December 1927 against Aston Villa. Player inset: Scottish International Willie Morgan." I have also found an absolutely stunning piece of old film footage on Google that shows Old Trafford as it used to be in the 1970s.